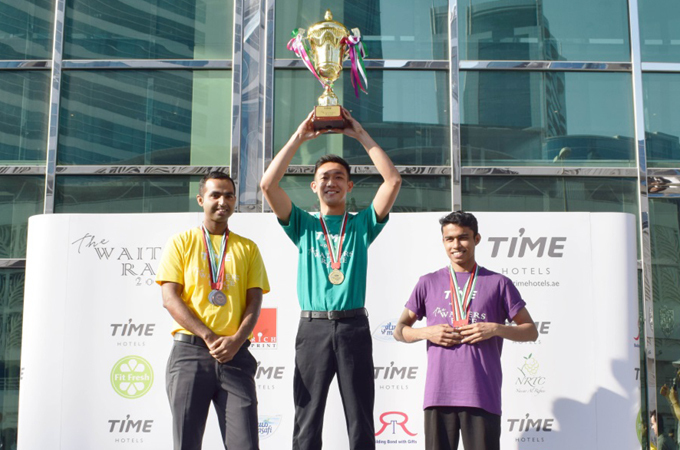 James Dunuan, from Grand Gourmet, beat off stiff competition to win the third annual TIME Hotels Dubai Waiters’ Race, which took place on November 23. Co-ordinated by TIME Oak Hotel & Suites – the only CSR labelled hotel in the Barsha Heights community - which also acted as the starting point for the hotly contested race, waiters had to negotiate the course through the Byblos Hotel and the Auris Metro Central, before sprinting back to the start line – a circuit of 720 m.
Runners faced a unique challenge as they were required to complete the run carrying a loaded tray containing two full glasses and a bottle of water. Speed, agility and balance were challenged at every turn as they raced through the streets of Barsha Heights. The racing waiters were judged on the amount of water lost, standards of waitering (posture, grooming, smile) and timing. Mohamed Awadalla, CEO, TIME Hotels, said: “The Waiters’ Race, which coincided nicely with the conclusion of Dubai’s Fitness Challenge, is now firmly fixed on the hotel sector’s calendar as one of the most keenly contested competitions in the emirate, and this year was no different with a record entry of top talent. Sponsored by Fit Fresh, NRTC, Rich Printing Press, Masafi and Water Hygiene Technologies - the 8 am start didn't deter entrants, with a total of 10 competing hotels, each fielding a waiters-only team of five runners. Participating hotels this year included TIME Hotels, First Central Hotel Apartment, Grand Gourmet, Flora Park Hotel, Citadines Metro Central Hotel, TRYP at Wyndham, JA Resorts & Hotels, Golden Tulip, Park Regis and Gloria Hotel & Resorts.